As we all know Star Citizen is the child of Chris Roberts (of Wing Commander and Ultima fame). Continually smashing every single crowd funding record in the world, and continuing to bring in funds ($77 mil to date and over 800 thousand star Citizens at the time of this writing) and growing momentum. Becoming a subscriber offers a few decent perks as well as keeps the game funded. Rounding into year three, they are offering even more. Check it out HERE if you're interested in further backing the game. I personally am a backer, with a small company. The big question is: is it worth it? well, honestly I think that depends on how much you want this game to succeed. A lot of the funds from subs goes towards videos, the monthly e-zine as well as swag. I highly suggest it as in my opinion its going to be the best Space Sim to date. 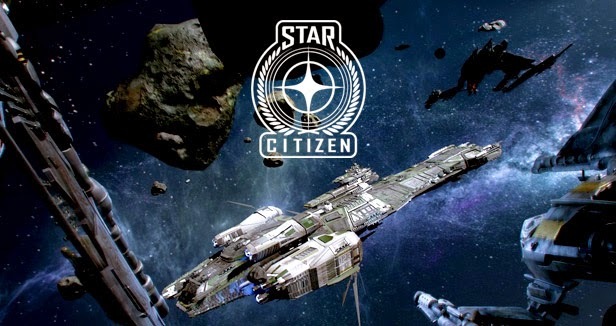 Feel free to comment below and let us know how you feel about Star Citizen and the growth its showed. UPDATE: Apparently the new FPS module will be called "Star Marine". Which I am totally stoked for, as most space sim players don't tend to be as versed in FPS combat...and that's pretty much my go to for competitive game play. While I might be wrong on this, I'm going to bet on this and hope for the best. Can't help but love the folks down at Chucklefish, Hell they get me through work. I really like this combat update. if you haven't had the chance to get into Starbound, it's similar to Terraria, but with Sci-Fi flair. You can find it on Steam as well as buy from their website HERE. This is surprisingly well made. I really dug the perspective and writing. I found this gem thanks to the Operation Pitchfork folks from RSI. I still hold out that the creator makes more.